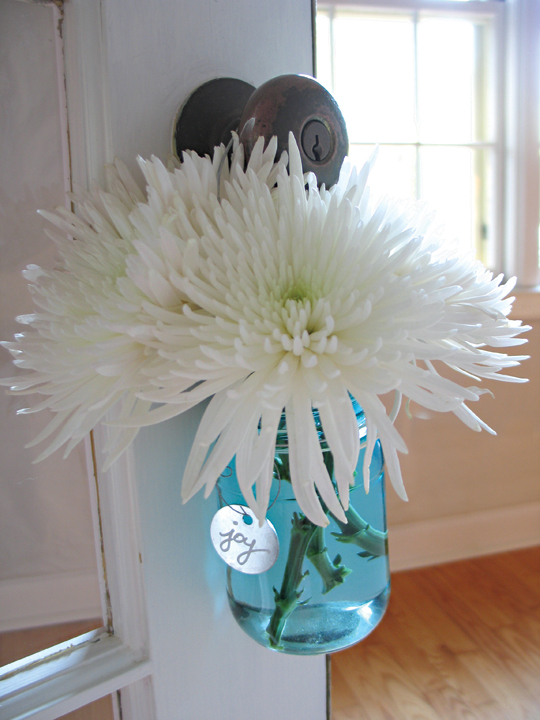 A little metal disc tag is just the casual embellishment needed to turn a vintage blue quart jar into a sweet summer vase. Use silver metal wire to wind securely around the jar lip for a hanging loop, or just wrap wire around to hold the circle tag. 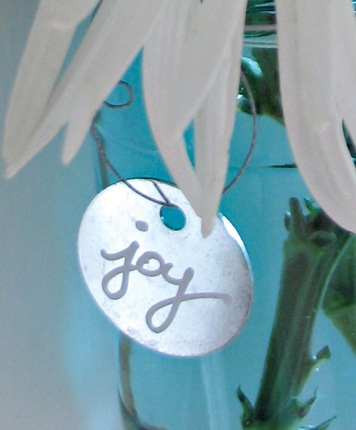 Write "joy" with a paint pen on the silver tag. Add flowers, et voila! This is one of the easy flower ideas in my book Inspirational Home: simple ideas for uplifting decor and craft. How sweet! Where do I find the metal disks? Thanks so much for a wonderful idea to perk up someone's day! Very pretty! 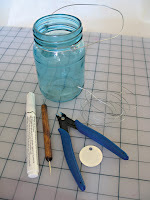 And I even have a blue green vintage canning jar... : ) On the first photo I had to smile because I didn't realize that your vase was hanging, and I thought it was perched precariously half-on-half-off a table (your wood floor). I was all impressed with your vase balancing skills. Thanks, Natalie! The metal disks were from a craft store like Hobby Lobby or Michael's. I think in the scrapbook department. Christina, you are too funny! Me and my mad skills! Ha!